Straight Curve has been lucky enough to secure a discount of 30% off this wonderful learning tool on behalf of Straight Curve visitors. Straight Curve highly recommends "Hollywood Camera Work". After having experienced the master class tutorial we have found it to be concise, easy to learn and rich in knowledge. Years in the making, The Master Course In High-End Blocking And Staging is the most comprehensive and ambitious Directing Course in the world. 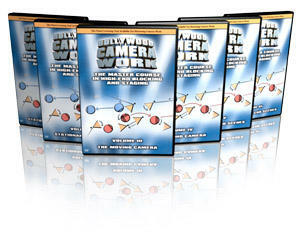 A groundbreaking learning tool, the course teaches high-end camera work through over 9 hours of 3D animated instruction on 6 Region-Free DVDs. For Directors, Cinematographers, Script Supervisors, 3D Animators, Visual Effects Artists, Game Designers, Videographers, Actors, Editors and writers. The Master Course is a powerful system of single-camera blocking and an unprecedented language of camera work, which may fundamentally change the way you direct. The primary goal of The Master Course in High-End Blocking and Staging is to do the most effective blocking with the highest production-value, and to build a vast repertoire of techniques to make Directing more expressive -- and ultimately more fun. The course also deals with the problem that blocking often grabs so much of our attention that we're forced to choose between doing camera work or nurturing great performances. If we choose acting, the camera work suffers. If we choose camera work, the actors are often left to direct themselves. One of the key goals of the course is to have great camera work become so automatic that we can do both at the same time. When shooting, we also too often abandon many great shots we had planned. When we're under pressure, we far too often revert to tried and tested techniques like two reverses and a master. Even if we know plenty of techniques, we often only use the ones we know extremely well, and another key goal of the course is to know techniques so well that we use them. To claim your 30% discount click the link below to take you to the Hollywood Camera Work Website and follow the instructions. 3. On the third check out page, enter "SCURVE" in the school account number field. $150 will now be deducted from the price. Good luck filmmakers let us know what you think.